Office 365 Users lets you access user profiles in your organization using your Office 365 account. You can perform various actions such as get your profile, a user's profile, a user's manager or direct reports. You can display this information in a label on your app. You can display one function, multiple functions, or even combine different functions. For example, you can create an expression that combines the User Name and Phone Number, and then display this information in your app. 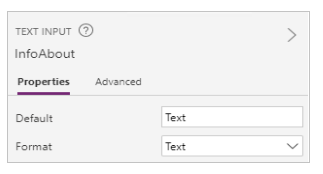 This topic shows you how to add Office 365 Users as a connection, add Office 365 Users as a data source to your app, and use table data in a gallery control. 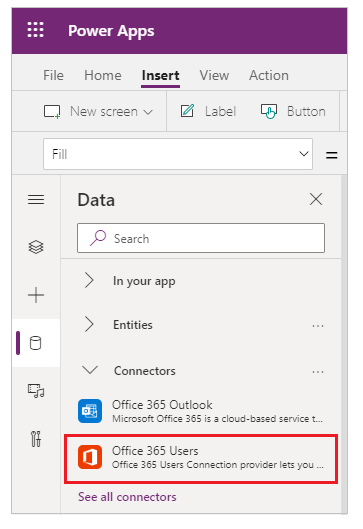 The Office 365 Users connection has been created and added to your app. Now, it's ready to be used. The label shows the information that you entered about the current user. In InfoAbout, type or paste an email address of a user in your organization. For example, type in yourName@yourCompany.com. The label shows the information that you entered about the user you specified or that user's manager. If you're developing an app based on an entity in the Common Data Service, you can specify a user based on ID instead of email address. If you create a contact and select that contact in the browse screen of the app, the Label control will show your display name. Add a Text input control (Insert menu > Text), and rename it InfoAbout. The gallery shows information about the direct reports of the user you entered. With the gallery selected, the right-hand pane shows options for that gallery. In the second list, select JobTitle. In the third list, select DisplayName. The gallery is updated to show these values. The first box is actually an image control. If you don't have an image, you can delete the image control, and add a label in its place. Add and configure controls is a good resource. Add a Text input control (Insert menu > Text), and rename it SearchTerm. Enter a name to search. For example, enter your first name. The gallery shows users whose name contains the search text you entered. In the second list, select Mail. In the third list, select DisplayName. The second and third labels in the gallery are updated. Get my profile: Retrieves the profile for the current user. Department string Department of the user. DisplayName string Display name of user. GivenName string Given name of user. JobTitle string Job Title of the user. Mail string Email id of user. MailNickname string Nickname of user. Surname string Surname of user. TelephoneNumber string Telephone number of user. AccountEnabled boolean Account enabled flag. Get user profile: Retrieves a specific user profile. Learn how to add connections to your apps.